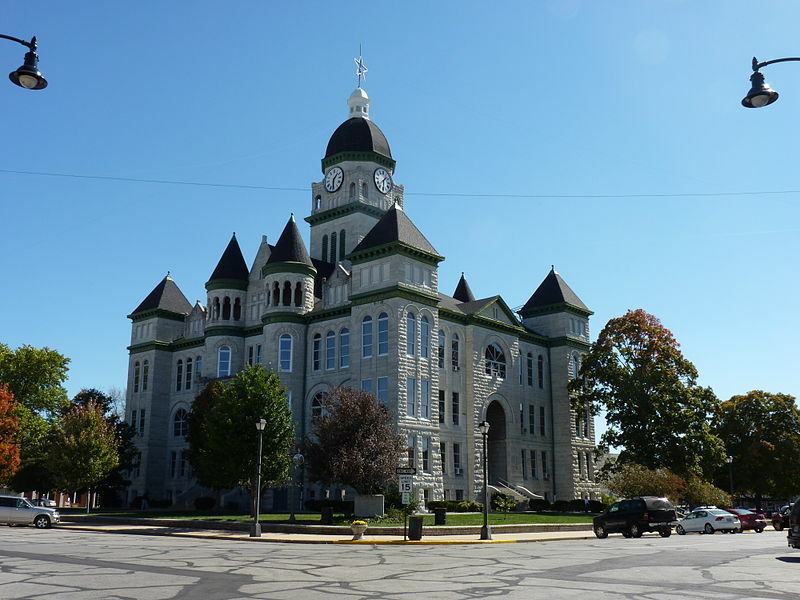 Jasper County Courthouse. Photo by Abe Ezekowitz. The death penalty was first used in Missouri in 1810 when Peter Johnson was hanged for murder. 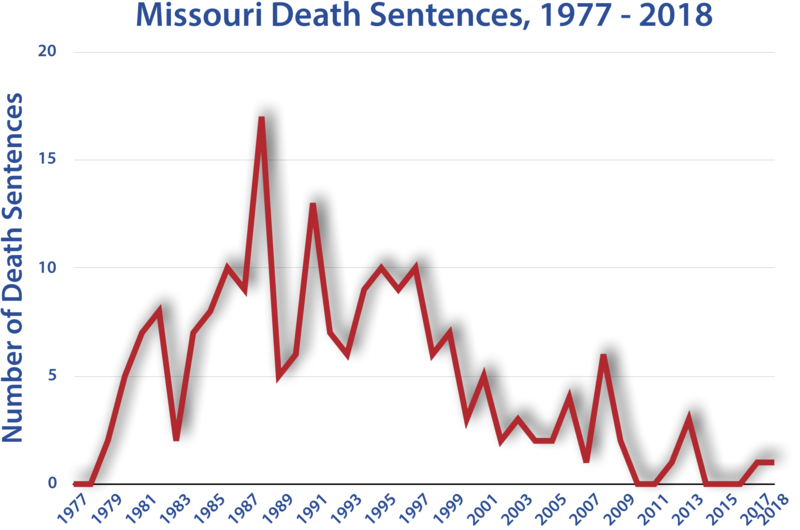 Missouri carried out a total of 285 executions from 1810 to 1965. Hanging was the primary method of execution until 1936, when lethal gas came into use from 1937 until 1987. Starting in 1987, lethal injection was added as an option for inmates in addition to lethal gas. Roper v. Simmons (2005): Christopher Simmons was 17 years old when he and two other teenagers, broke into the home of Shirley Crook, kidnapped her, and pushed her off a bridge into the Meremac River. Simmons bragged about the murder to friends, and eventually confessed to police. He was convicted of the crime and sentenced to death. Simmons appealed the death sentence on the basis that he was only 17 years old at the time of the crime, and the execution of a juvenile was cruel and unusual punishment in violation of the Eighth Amendment. The Missouri Supreme Court ruled in favor of Simmons, overturning his death sentence and sentencing him to life in prison without parole. 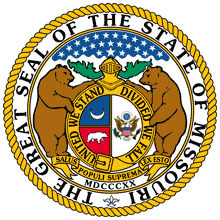 The State of Missouri appealed the case to the U.S. Supreme Court. The Court ruled that execution of individuals who were under 18 at the time of their crime was unconstitutional. In its decision, the Court noted a "national consensus" against the practice of executing juvenile offenders; just 20 states allowed the juvenile death penalty by statute, and only 3 had executed a juvenile offender in the last 10 years. Joseph Amrine was serving time for robbery and burglary in Missouri State Penitentiary when he was accused of stabbing fellow inmate Gary Barber, in 1986. No physical evidence linked Amrine to the crime, and he was convicted primarily based on tesimony from other inmates and was sentenced to death. Amrine appealed his death sentence and the Missouri Surpreme Court found "clear and convincing evidence of actual innocence." Three inmates who had previously testified recanted their statements, saying they lied in exchange for protection. Six other inmates testified to seeing Amrine playing cards at the time of the murder. The court ordered that Amrine be released within 30 days unless he was charged with another crime. Missouri prosecutor Bill Tackett brought new murder charges on Amrine, but dropped the charges a month later after DNA tests conducted on blood stains from the crime were inconclusive. Amrine was freed in August 2003. Darrell Mease was convicted and sentenced to death for the murder of his former drug partner, Lloyd Lawrence, Lawrence's wife, and Lawrence's grandson. He was scheduled to be executed in 1999. Pope John Paul II was visiting Missouri at the time and made a personal plea to Governor Carnahan to grant Mease mercy. The day before Mease's execution, Governor Carnahan granted Mease clemency, commuting his sentence to life without parole.